Congratulations to Nona Sivley, the winner of Hell's Kitchen Season 8. Nona, along with her family joined us for the finale of the show on December 15 and we look forward to welcoming her to Chef Kerry Simon's team at LA Market and to the Marriott family. 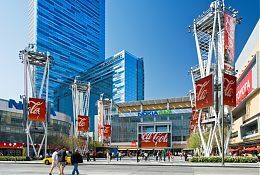 Stay at the JW Marriott Los Angeles at L.A. LIVE and enjoy an insider shopping experience in the nation's largest fashion district with a personally guided tour to the famous LA Fashion District. Find hot fashions by L.A.'s newest designers and more, at below-retail prices, as your guide leads you to the best retail-wholesale locations in the city. The Urban Shopping Adventure package starts at $299 per night. Call (213) 765-8600 to make reservations, or click below and enter code XYO when booking. 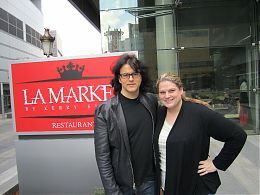 Join us at LA Market as dineLA returns to Los Angeles' top restaurants. Highlights from our dineLA lunch menu include Winter Squash Soup with amaretto cookies and cream while dinner brings Short Ribs with pomme puree, blue foot mushroom, cipollini onion and a merlot reduction. dineLA will be held January 23-28 and January 30- February 4. A 3-course lunch menu will be offered for $22.00 and the 3-course dinner menu for $34.00, exclusive of tax and gratuity. For reservations, please call 213.765.8600. Pamper yourself with our special midweek prices. 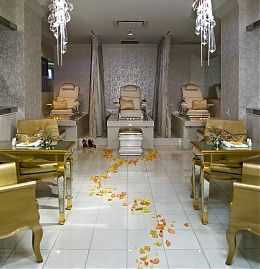 Treatments include a 50 minute Swedish Massage for just $99; a 50 minute Cleansing Facial for $99 and a 60 minute Manicure/Pedicure for $75. These rates are offered Monday-Thursday only. Please mention the "Midweek Promotion" at the time of booking. For an appointment, please call (213)-763-4401. Take in a day at The GRAMMY Museum to experience this one-of-a-kind exhibit with exclusive artifacts from John Lennon's life. Afterward, indulge in a Junk Food Platter at LA Market from "Rock 'n Roll Chef" Kerry Simon before retreating to your guest room for relaxation, renewal and picture-perfect views. The John Lennon Songwriter Package starts at $219 per night. Call (213) 765-8600 to make reservations, or click below and enter ARN when booking. Show your same day ticket stub from any L.A. LIVE venue, including STAPLES Center, Nokia Theatre, Club Nokia, Conga Room, Regal Cinemas and GRAMMY Public Performances and receive 15% off at LA Market, gLAnce Wine Bar, The Mixing Room and WP24 Lounge. Rates start at $179. Call 213.765.8600 to make a reservation, or click below and enter code ICP when booking.